The launch is North Korea’s first since its test of a claimed thermonuclear bomb on September 3. Early on Friday morning, North Korea launched an intermediate-range ballistic missile (IRBM) from a launch site at Sunan, near Pyongyang International Airport, into the northern Pacific Ocean. The launch is its first since it tested what it claimed was a hydrogen bomb on September 3, drawing widespread international condemnation and spurring a new round of United Nations Security Council sanctions. According to data released by the South Korean military, the missile flew to a range of approximately 3,700 kilometers while reaching an apogee of 770 kilometers over a flight time of 17 minutes. Japan warned civilians on Hokkaido of a missile overflight, activating sirens and issuing electronic alerts. It was the longest demonstrated flight test of a ballistic missile ever conducted by North Korea and the second instance of the country overflying Japan with a system designed to deliver nuclear warheads. (It did so for the first time just weeks ago, on August 29.) U.S. Pacific Command assessed the missile to have been an IRBM, suggesting that it was a Hwasong-12—the missile North Korea first successfully tested in May 2017. Below are a few thoughts on North Korea’s latest ballistic missile test, based on the early data. A familiar approach. Notably, on Friday, North Korea chose to launch the IRBM out of Sunan—the same site where Kim Jong-un observed a Hwasong-12 launch on August 29. The August 29 launch was North Korea’s first-ever overflight of Japan with a ballistic missile system. (It had previously flown four satellite launch vehicles over Japanese territory, but those were not designed to delivery any sort of explosive payload.) The choice of Sunan again suggests that North Korea see this airfield as a major missile basing site, adding to a constellation of such sites across the country. Friday’s trajectory also had similarities to the last Hwasong-12 launch. One of the features of the August 29 trajectory that was immediately notable was how it crossed over Japanese territory roughly in the vicinity of the Tsugaru Strait, which separates the Japanese islands of Hokkaido and Honshu. The only major Japanese urban center to fall under the missile’s trajectory was Hakodate in Hokkaido. The trajectory almost appeared to have been designed to allow North Korea to test its missiles to a longer range while overflying as little of Japan’s territory as necessary. The launch was no doubt still provocative, but the provocation was more muted than it would have been had North Korea simply overflown Honshu, near the population-defense Kanto region, for example. North Korea repeated this azimuthal approach with Friday’s launch. One important difference was that the missile this time flew to a range of 3,700 kilometers. That suggested this was North Korea’s first test attempt of the Hwasong-12 IRBM to full-range at a trajectory close to what’s known as the minimum energy trajectory—the most efficient trajectory that allows for a maximization of the missile’s range. Remember: North Korea basically told us it was going to do this. We’d been warned. With two tests along this trajectory, we should have a much better idea of what is likely to become a regular-use missile corridor for North Korean long-range testing. The second test along this trajectory without any attempt at interception or any reaction from Japan and the United States beyond rhetoric will likely not serve to deter North Korea from future launches. Pyongyang will keep using this trajectory for long-range missile tests, fully aware that the two allies are likely incapable of or unwilling to attempt interception. The Hwasong-14 intercontinental-range ballistic missile (ICBM) will likely be the next to see flight-testing along this trajectory. A message to Guam. 3,700 kilometers, with little doubt, is North Korea’s longest-ever demonstrated ballistic missile range now—surpassing the 2,700 kilometers demonstrated on August 29. 3,700 kilometers, however, also resonates strategically for North Korea. It credibly demonstrates that the country could strike the U.S. territory of Guam, if it desired. U.S. intelligence agencies already assess, in consensus, that North Korea is capable of mating compact nuclear devices to its ballistic missiles, so after Friday’s test the only remaining question is accuracy. While accuracy may not matter much for a thermonuclear warhead on a Hwasong-14 intercontinental-range ballistic missile heading for a U.S. city, it would matter for attacks on military targets on Guam, such as Andersen Air Force base. In any case, proving that it has missiles capable of reaching Guam is an important step for North Korea. It has the effect of making its nuclear strategy all that more credible. A technical purpose? As I’ve explained elsewhere, North Korea doesn’t carry out these tests to be brazenly provocative for no reason. While this test may have had the political weight of signaling displeasure over the recent round of UNSC sanctions, it also likely provided North Korea with important technical data (in addition to fleshing out the credibility of its nuclear strategy). The full-range flight on a minimum energy trajectory, in particular, would have allowed the missile’s reentry vehicle to experience precisely the kind of physical and temperature stresses it would endure in operational use. However, the same question that lingered after the August 29 test remains: how would North Korea have observed the missile in the later stages of flight? Because it lacks satellite and its coastal radars would be limited in observational capacity by the curvature of the earth, North Korea would presumably either have to forgo observation altogether or have sent ships to the presumed splashdown point. So far, we have no evidence from the August 29 launch that it attempted to send ships to observe the splashdown. 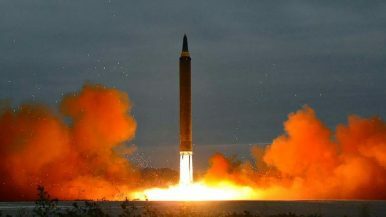 However, one U.S. government source with knowledge of North Korea’s ballistic missile tests did tell The Diplomat that U.S. military intelligence detected that the August 29 reentry vehicle survived successfully to an altitude of 1 kilometer—performance that is likely sufficient to deliver a nuclear airburst. We’ll no doubt learn more about this test soon if Kim Jong-un observed it. (He likely did.) On Saturday, North Korea should release images, video, and a statement of what it sought to observe. North Korea's reentry vehicle technology is likely where it needs it to be, but it may choose to test to longer ranges.